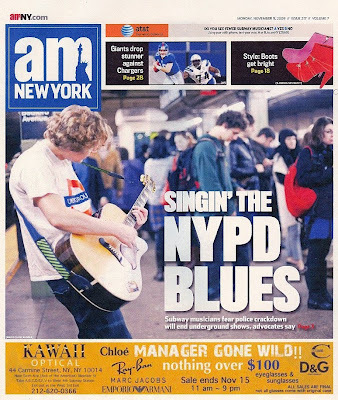 Theo Eastwind, the infamous troubadour of the underground is featured on the cover of AM New York as the main voice behind "busker's" rights. Fifteen years working the subway has given Theo much expertise in wooing an audience and dealing with a sometimes less than friendly officer of the law. Theo is a staunch advocate of free speech and helped wage the battle to allow musicians to sell their wares as part of the 1st amendment's rights..
Theo is featured in this article on busking in the NYC subways. Theo asks the readers of the Wall Street Journal to fork it over.